There are many different options in the market place to destroy hard drives. Everything from erase software, to degaussers, to many different forms of physical destruction. So the question becomes “What is the best solution for me”? For most State and Local Governments, this is an entry level destruction option. You can use either use a crushing method such as the SEM Hard Drive Crusher or for added security, shred the drives using the SEM Model 0300 HDD Shredder. The SEM AUTOMATIC hard drive “crusher” destroys all hard drives regardless of their size, format or type (up to 1.85” thick), including drives found in Laptop, Desktop and Server Systems. The Model 0101 has been tested by the NSA and is listed by the NSA as the highest performing HDD punching device making It suitable as a physical destruction solution of the DoD mandated “Degauss and Destroy” Process . When it comes to the fast, safe, easy destruction of hard drives, nothing outperforms the Jackhammer™ from SEM. This slow speed, high torque shredder uses specially designed saw tooth hook cutters to chew up about 8 hard drives in a minute that produce a 1.5” wide particle size. That’s just 7.5 seconds per drive. The unit is designed for an Office Environment and plugs conveniently into standard wall outlets. Check out the SEM VIDEOS of each product on the SEM Web site. For a higher level of Security, State and Local Governments may want to consider the two step process of “erasing data” with a Deguasser and Destroying the media with a Crusher. This would give you piece of mind that the drive has been degaussed thereby sanitizing the information and then physically destroying the media to make it inoperable. Below is our most popular option. 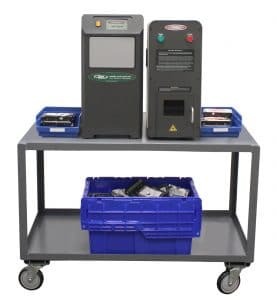 The SEM EMP1000 is the most powerful commercially sold degausser on the market today. With power at 16,000 gauss (1.6 Tesla) , it erases the highest coercivity magnetic media available today without the use of any adapters. The automatic SEM Hard Drive Crusher destroys all hard drives regardless of their size, format or type (up to 1.85” thick), including drives found in Laptop, Desktop and Server Systems. The Model 0101 has been tested by the NSA and is listed by the NSA as the highest performing HDD punching device making It suitable as a physical destruction solution of the DoD mandated “Degauss and Destroy” Process. ( SEM Model EMP100-HS ) and NSA Listed Crusher ( SEM Model 0101). With an NSA approved degausser, ALL of the information on the drive is erased. gives you the most secure information sanitization program and thus…. 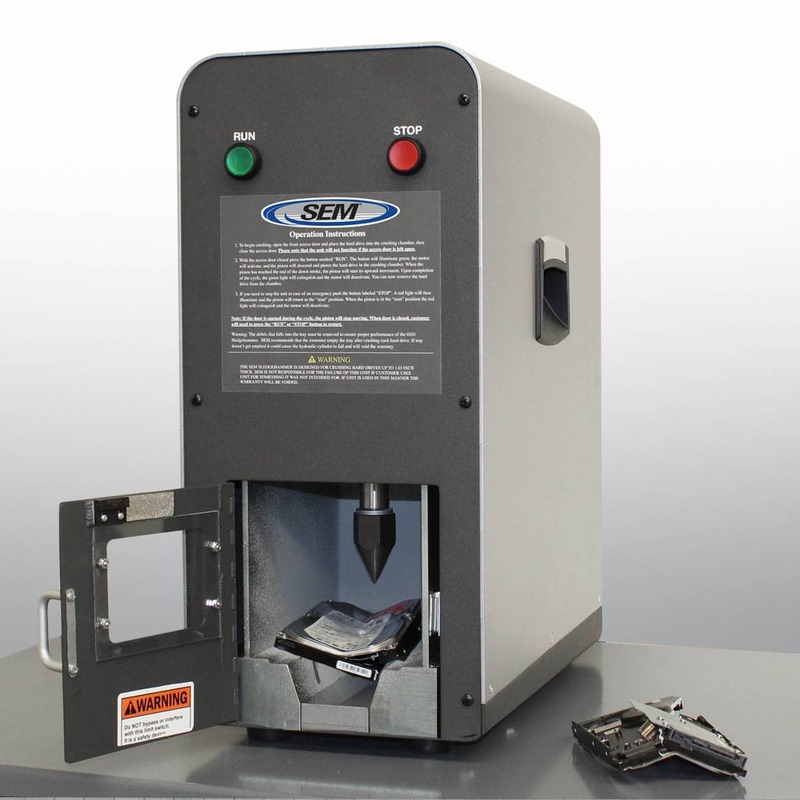 If you need to destroy hard drives, laptops, blackberries or any other type of electronic media, SEM has a solution to meet a wide variety of budgets. For more information on Hard Drive Destruction Bundles please visit our website at www.semshred.com/state or contact us directly at 800-225-9293 EXT 1048 or m.sousa@semshred.com to discuss any of your destruction needs.